We’d love your help. Let us know what’s wrong with this preview of Dreams in Deadwood by Kari Trumbo. He has a vice as bad as her father. Jennie Arnsby wants nothing more than to turn around and go home. Her family is on their way to Deadwood, SD, when Aiden finds his way to their small wagon train. His teasing and banter leaves her wanting to toss him out the back and in the dust. When, they are separated outside the city, she is left wondering if she’ll ever see him again He has a vice as bad as her father. To ask other readers questions about Dreams in Deadwood, please sign up. 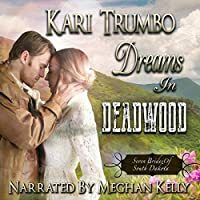 Dreams in Deadwood by Kari Trumbo is a sweet western romance. The series itself follows characters first introduced in A Ruby Glows (part of the Cutter’s Creek series) – a family of sisters relocating to Deadwood, South Dakota. It can be definitely read as a stand alone but there were times, especially early on, when I felt like everyone knew each other but me lol. The romance between Aiden and Jennie is full of flirting (mostly from Aiden) and emotion (mostly from Jennie) and some great kisses! Aiden in particular is flawed but solid, keeping him relatable as well as swoony. His backstory is intriguing and layered. While I loved Aiden as a character, more than once Jennie’s character seemed flat to me. Her decisions, her dialogue, her actions … sometimes she just didn’t make sense to me. Along those lines, a new element of her character/backstory is introduced nearly at the end of the book, a time when I was expecting storylines to wrap up not get started. Bottom Line: Overall, Dreams in Deadwood is a great way to spend an evening (or a weekend, depending on reading speed). Readers will find both the history and the hero engaging, the heroine sweet if a little shallow. Jennie’s sisters set up a nice foundation for the rest of the series, too, particularly Hattie and her decisions. If you’re a fan of western romance, you’ll want to try these books! Book one in the Seven Brides of South Dakota Series, Dreams in Deadwood, by Kari Trumbo, is an excellent sweet inspirational western romance that readers will absolutely fall in love with. From the very beginning of the novel, the characters come to life off the pages and readers will come to know and love them. Trumbo’s excellent storytelling and rich western theme will keep the attention of readers from the first page all the way to the very end of the story. Through overcoming the struggles o Book one in the Seven Brides of South Dakota Series, Dreams in Deadwood, by Kari Trumbo, is an excellent sweet inspirational western romance that readers will absolutely fall in love with. From the very beginning of the novel, the characters come to life off the pages and readers will come to know and love them. Trumbo’s excellent storytelling and rich western theme will keep the attention of readers from the first page all the way to the very end of the story. Through overcoming the struggles of living in the west, as well as battles of the heart, Trumbo touches the hearts of and inspires her readers. Although some of the dialogue in the story is a little flat, the story, hero, heroin, and sweet romance will keep readers engaged. This is a story that readers of sweet western romance will definitely enjoy. In the Audible audio version of the Dreams in Deadwood, the narrator does an excellent job of bringing to the life the story and the voices of the different characters, making this already fun and enjoyable story a pleasant listen. An Audio review copy of this book was provided by the author, as well as a print copy of the book won in a giveaway from the author. A review was not required and all views and opinions expressed are my own. I like a male lead who is a little rough around the edges, and Aiden was that person for me. Combine that with a stubborn woman and it makes for an interesting storyline. I found Jennie to be set in her ways, and although she says she'll do as she's told, she does it sort of grudgingly. Ms. Trumbo picked wonderful setting in the historic novel and I enjoyed reading about their journey as much as when they arrived in Deadwood. It was evident that the author did her homework in researching this ti I like a male lead who is a little rough around the edges, and Aiden was that person for me. Combine that with a stubborn woman and it makes for an interesting storyline. I found Jennie to be set in her ways, and although she says she'll do as she's told, she does it sort of grudgingly. Ms. Trumbo picked wonderful setting in the historic novel and I enjoyed reading about their journey as much as when they arrived in Deadwood. It was evident that the author did her homework in researching this time period. The thing I like about historic reads is that they transport you into a different time, setting and way of life. I like to picture myself riding next to Jennie, and going over every bump in the road. Or arriving in Deadwood and looking at it for the first time, hoping it provides promise and opportunity. I felt the descriptions were true to the time period, and liked the fact that at the end of the book there is a section specific to the historic aspects of the story. I appreciate authors who go that little extra mile. I'm glad the focus wasn't on Jennie and Aiden as a couple, but more as separate beings. They each had to find their way in the world before they could even think about being together. Writing it this way made the story more real to me, and more enjoyable. I think historic fans will enjoy this book! This was a sweet, fun, romantic, emotional romp through American history. I've loved the Arnsby family since reading A RUBY GLOWS where I first met Jennie and her sisters. I am so glad Jennie found a man who could be patient with her, protect her, and love her. Aiden is a hardworking man, who loves his family, is loyal to a fault, and falls hard to Jennie. So sweet! This was a well-written historical romance that focuses on the development of characters rather than unnecessary sexual elements. Gre This was a sweet, fun, romantic, emotional romp through American history. I've loved the Arnsby family since reading A RUBY GLOWS where I first met Jennie and her sisters. I am so glad Jennie found a man who could be patient with her, protect her, and love her. Aiden is a hardworking man, who loves his family, is loyal to a fault, and falls hard to Jennie. So sweet! While reading this I kept thinking that I've started a series part way through, but no, this is book one, and yet, I definitely feel like there's history I should know and don't. Jennie and Aiden are so sweet together, the chemistry is there from early on and the way they dance around each other is amusing. The relationship develops in a believable way and the other characters form a great supporting cast. I loved Jennie's stubbornness at times and at others I wanted to tell her to stop. Her abili While reading this I kept thinking that I've started a series part way through, but no, this is book one, and yet, I definitely feel like there's history I should know and don't. I loved Jennie's stubbornness at times and at others I wanted to tell her to stop. Her ability to sense when something was wrong was interesting and not really explained, I'm hopeful this will come out in future books in the series. The character voices are excellent and the different moods of the characters and the story came through in the narration. Loved this book! Jennie and Aiden are characters you cant help fall in love with. Jennie was so cute! Her character had her sometimes a young girl but sometimes a woman. She had me laughing at how cute she could be. The story is one about forgiveness, the prodigal son returns home and romance. I know you will love this book as much as me. I have to read the second book in the series! You will love this book and series! Will love overcome the list for gold or family obligations? A young girl was uprooted from home and moved to Deadwood S. D. by her sister and brother-in-law. Along the way she meets a man who is good hungry and has a past he can't explain. The young lady refuses to marry because of her ma and pa's marriage. They go back and forth on the idea of marriage, will they get together. It also tells of her sister's, one who leaves in a mysterious way. A very entertaining story and fantastic characters. I Will love overcome the list for gold or family obligations? A young girl was uprooted from home and moved to Deadwood S. D. by her sister and brother-in-law. Along the way she meets a man who is good hungry and has a past he can't explain. The young lady refuses to marry because of her ma and pa's marriage. They go back and forth on the idea of marriage, will they get together. It also tells of her sister's, one who leaves in a mysterious way. A very entertaining story and fantastic characters. I read it in about 7 hrs it was that good, I couldn't put it down. A definite 5 star read. I hope you enjoy it! This book kept my attention the whole way through. I loved it!! It was a clean, wholesome tale about a family that moved to a town none of them knew anything about. Along the way they meet a man named Aiden, who joins them on their journey and becomes a very important part of their life. Read about how he and one of the girl's fall in love, but then he has to leave. It is an adventure you don't want to miss! Dreams in Deadwood by Kari Trumbo is the first book in the Seven Brides of South Dakota series. It is a clean romance set during the gold rush era. Unlike most books of this genre (with yet another mail-order bride), here we have a family of sisters relocating to Deadwood, South Dakota. The story centers around Jennie Arnsby who wants nothing more than to turn around and go home. Along the way, Jennie and her family meet Aiden Bradly who left Kansas in search of the riches that the gold rush promised. After basically being robbed of everything including his horse, he finds his way to their small wagon train. Jennie and Aiden struck up a “hate ‘em til you love ‘em” romance. However, this is not your stereotypical romance; instead, we have an understated romance that develops slowly. Near the end of the book it only seems natural when Jennie falls in love with Aiden while nursing him and his wounds back to health. However, Aiden never gives up his desire to return home to Kansas, which he eventually does, without the gold he promised his family and without Jennie. I was reminded of the famous quote by Richard Bach: If you love someone, set them free. If they come back to you, they are yours. If they do not, they never were.” Since this is a romance, there was no doubt that Aiden would return. My favorite part of the book was when Aiden convinced his parents and brother to move to Deadwood. His homecoming, both in Kansas and in Deadwood, was truly heartwarming. This is such a great story. I can't wait to read the rest of the series. It is so well written and gives a glimpse of Deadwood, which I will be visiting in June. This was a delight to read,very well written and the Story is Easy to follow. Time and space does not change a lot with in true Love. Never a boring moment from the moving wheels of a Wagon to the destination. I give this a 5🌟 rating. I enjoyed this Book. This sweet family oriented romance draws on the old fashioned values and practices typical of the time. Jennie resists leaving a place she feels at home and going somewhere new, even though family is going with her. She meets Aiden who is battling his own demons and desire to be a son his family can be proud of. Tragedy strikes more than once as the author keeps the story exciting. An enjoyable romance with a satisfying ending hinting at more stories to come. Truly enjoyed Jennie and Aiden's story. Well developed, likable characters who grow and evolve. Can't wait for the next book! Well written and incorporates real events. I have been to Deadwood and I can see a story like this happening back then! Hero is Aiden. Heroine is Jennie This is book 1 of the 7 sisters. Jennie is on her way to Deadwood SD. She dreads going there all she wants is go back home Half way there she meets Aiden Jennie doesn’t know how to take Aiden. Aiden has a purpose in life. Find his gold and go home . Aiden is attracted to Jennie but he doesn’t want to get off tract. Jennie is traveling to Deadwood with her family when Aiden comes across their path. She's not sure what to make of his attention and keeps him at arms length. This was a charming story that had me yelling back at the audiobook during the last few chapters, lol. I really enjoyed this book. This is the first book I have read from this author, but it won’t be the last. I look forward to reading more. I liked all of the characters. I really liked Aiden and Jenny. I think the storyline progressed pretty well. I recommend this book. I also highly recommend the audiobook version. I listened to the whole thing in a few hours, it was that good. A sweet adventure of healing and finding love! 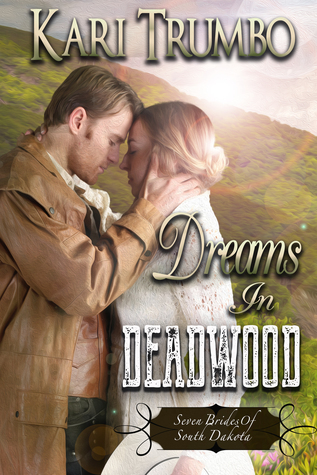 Dreams in Deadwood is a sweet western romance in the Seven Brides of South Dakota Series. This is a story that shows a person can change and keep their promises when love is on the line. You learn so many different lessons in this story – honesty, forgiveness, love, respect, healing and even how to overcome the hardships that we all face in life. Even though tragedy strikes, Aiden and Jennie still find love and healing together. A delightfully writte A sweet adventure of healing and finding love! A delightfully written story with romance, new beginnings and a happy-ending that we all have come to expect. I had a hard time putting down as it was a one-of-a-kind and captivating story. I couldn’t get to the end fast enough to see if love would win out. A new life in a new town is more than enough change for Jennie Arnsby. Yet, when Aiden Bradly joins their group as the wagons near Deadwood, South Dakota, more change is exactly what she gets. A story of letting go of past mistakes and hurts, Kari Trumbo brings readers into the hustle, bustle, and dangers of the newly-formed gold rush town. As Aiden challenges Jennie to find something she likes about her new home, she challenges him to let go of something he’s been dead-set on since leaving his fa A new life in a new town is more than enough change for Jennie Arnsby. A story of letting go of past mistakes and hurts, Kari Trumbo brings readers into the hustle, bustle, and dangers of the newly-formed gold rush town. As Aiden challenges Jennie to find something she likes about her new home, she challenges him to let go of something he’s been dead-set on since leaving his family home over a year before. Tension is well built throughout the store, not only in the romance elements but also with the dangers of a rapidly growing town filled with men in the 1890s. This was the first book I’ve ready by this author, but it won’t be my last. While this is a standalone book, the first one in the Seven Brides of South Dakota series, there were several references to Jennie’s older sister’s past. Ruby’s story was told in a previous book, A Ruby Glows. You won’t feel lost reading Dreams in Deadwood without reading the previous book, but it may enhance your reading experience and give you more insight into this family of eight (yep, eight) sisters. Dreams in Deadwood: Seven Brides in South Dakota Book 1 is by Kari Trumbo. This starts the second in the series about the seven sisters of the Arnsby family. Ruby and Beau head out from Cutter’s Creek to Deadwood to begin a new life along with Ruby’s sisters. Jennie Arnsby, the second oldest girl, doesn’t want to leave Cutter’s Creek and their Mother. She wants to stay here where it is fairly small and the community is nice. She doesn’t want constant change. However, her Mother insists on her go Dreams in Deadwood: Seven Brides in South Dakota Book 1 is by Kari Trumbo. This starts the second in the series about the seven sisters of the Arnsby family. Ruby and Beau head out from Cutter’s Creek to Deadwood to begin a new life along with Ruby’s sisters. Jennie Arnsby, the second oldest girl, doesn’t want to leave Cutter’s Creek and their Mother. She wants to stay here where it is fairly small and the community is nice. She doesn’t want constant change. However, her Mother insists on her going to take care of the younger girls. Reluctantly, Jennie goes and drives one of the two wagons. One evening, a man staggers into camp with his saddle. His horse had given out and he had been walking. Beau allows him to stay with them until Deadwood. Aiden flirts with Jennie while he drives the wagon. Jennie takes offense at his flirting and fights with him. Before this can explode into something else, Beau throws Aiden out of camp when the dog Aiden rescues bites Jennie. Will they be able to find a home in wild Deadwood? Will Beau find a job that can support his huge family? Will Aiden show back up? Will younger Harriet set her sights on Aiden to spite Jennie? Having grown up in the Mount Rushmore state, I was pleased to find a series of western romances set in the Black Hills. I spent a great deal of my childhood and adolescence in the area the area the book takes place, since I have an aunt & uncle who lived in Lead (until their recent passing). I love the strength and integrity possessed by Aiden, as well as the pluck and desire to protect her heart displayed by Jennie. That they belong together is clear from the beginning, and I adore the way t Having grown up in the Mount Rushmore state, I was pleased to find a series of western romances set in the Black Hills. I spent a great deal of my childhood and adolescence in the area the area the book takes place, since I have an aunt & uncle who lived in Lead (until their recent passing). I love the strength and integrity possessed by Aiden, as well as the pluck and desire to protect her heart displayed by Jennie. That they belong together is clear from the beginning, and I adore the way the author pulls them together without rushing things. This is a sweet clean historical, western romance. A group of sisters are moving to the wild town of Deadwood. They meet up with a lone traveler along the way. There are plenty o twists and turns to keep the listener on the edge of their seat. Will a real romance develop or will family obligations and differences keep them apart. Interesting start to this series. I'd like to see where it goes from here. The narration was well done. The characters were well portrayed. Meghan Kelly did a wonderful job. A wonderful beginning to the Seven Brides of South Dakota series by new-to-me author Kari Trumbo with memorable characters and beautifully written story that gives an afternoon of reading pleasure and a glimpse of history in and around Deadwood in the 1890's. I loved the sweet and tender romance between Jennie Arnsby and Aiden Bradly. Dreams in Deadwood is a must-read for fans of this genre. I voluntarily reviewed a complimentary copy of this book and enjoyed it so much I purchased a copy. This is a sweet historical romance. I was quickly rooting for Aiden and Jennie. There is a love for family very evident in the book. The characters develop throughout the story. The dialogue felt natural. There are some interesting historical facts sprinkled through the book. I would not hesitate to recommend this book to readers of historical romance. I will look for more opportunities to read Kari Trumbo’s work. The great character and storyline development hooked me right from the very beginning and I stayed totally captivated until the very last page! This was the first book that I have read from this author and it definitely will not be the last! Ms. Trumbo weaves a remarkable tale about a covered wagon trek from Montana to South Dakota. Read full review in the 2017 June issue of InD'tale Magazine. A lot of action suspense and mystery, along with romance heart ache and happiness. Make sure you read about Ruby in the cutters creek series to catch up on this story. Can't wait to see where this picks up. This was a great way to start the series! Don't miss A Ruby Glows as the prequel to this story as well! I especially loved the "angel" stranger that gave Aiden a ride near the end! I just got to read the first chapter of this book. It was sent to me to give an honest review. I can say the book was very interesting and look forward to finding out what happens and will read more of Kari Trumbo books in the future.